We have always been big into watching Disney shows and always look forward to when they have a new show. Its kind of like getting excited for a movie premiere for the little ones! Doc McStuffins was one of those we were excited when it first came out! Doc McStuffins: Time for Your Check Up!,” the second DVD compilation for Disney Junior’s hit animated TV series “Doc McStuffins,” was released on May 7, 2013. It includes 5 exciting episodes and a FREE growth chart for the lil ones to keep up with their own health and growth. 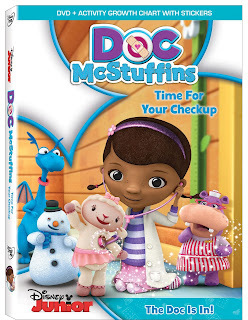 The Synopsis says "2012's #1 cable TV series in Kids 2-5, Doc McStuffins tells the story of a nurturing six-year-old girl who heals stuffed animals and broken toys out of her backyard playhouse clinic. Assisting Doc at the clinic are her trusty team of lovable stuffed animals including: Stuffy, an overly proud dragon; Lambie, her cuddly best friend lamb; Hallie, a jolly and caring hippo nurse; and Chilly, a snowman who spends a lot of time getting check-ups at the clinic. Whether it's a case of loose stitching, low batteries or a blow-up toy who has sprung a leak, Doc and her pals are always there to lend a helping hand, while imparting to young viewers the importance of taking care of oneself and others." It's actually pretty funny because nowadays we will be sitting in the living room and we' ll hear the kids in the other room giggling saying let's play doctor. Normally I'd be a lil worried since I have boys and Amy has girls but they are copying off the show. Plus now they are less frightened by the doctors office and appointments. Recommendation: Declan was actually the biggest fan of this DVD as he had me open it right away and was pretty zoned in throughout the first couple days. I just love how this tv show helps little ones get more comfortable with doctors and all they can do for them! Giveaway: Disney is going to give one of A Lucky Ladybug's lucky readers Doc McStuffins DVD of their own! I like that your blog post background is white. I only wish it were a bit wider. You sidebars are a bit overwhelming. I focus mainly on your posts and don't see the sidebars much.